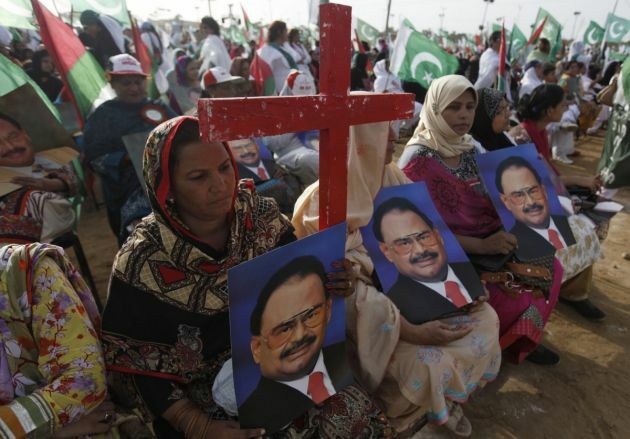 (Photo: REUTERS / Akhtar Soomro)Female Christian supporters of Pakistan's Muttahida Quami Movement (MQM) political party carry posters of their leader Altaf Hussain and a cross while listening to a speech during a rally to show solidarity with the Pakistan Army in their ongoing offensive against militants in North Waziristan, in Karachi July 6, 2014. A Muslim leader has said people should follow the "teachings of Jesus" and "turn the other cheek" at a seminar on inter-religious unity and harmony among different faiths on World Peace Day in Pakistan. Christian and Muslim leaders met in Faisalabad, Pakistan to celebrate World Peace Day and foster unity among different faiths on September 21. The conference was organized by the South Asia Partnership-Pakistan in collaboration with the Parish of the Assumption (Arooj-e-Maruim), that was built by joint Christian-Muslim contributions, and the Agency for Sustainable Development-Pakistan. Maulana Muhammad Yousaf Anwar praised the efforts "of the Catholic community around the world to promote peace and peaceful co-existence," Asia News reported. Anwar called on those present to follow" the teachings of Jesus Christ "when he says to" turn the other cheek" when offended. "Religious leaders must be united for peace and promote the protection of minorities," he noted. More than a hundred lay people, religious, teachers, catechists, students, parliamentarians, activists and human rights lawyers joined in the discussions. Before the meeting, the participants gathered in the church of Arooj-e-Maruim for a solemn Mass where they sang hymns and verses of peace, religious songs, and prayers for peace. During the mass, Father Nisar Barkat, director of the Diocesan Commission for Interreligious Dialogue, made a special prayer to those who were hurt in "terrorist attacks." A prayer was also uttered for the unity and harmony of different faith and ethnic groups. The talks highlighted efforts to promote inter-religious unity around the globe. One speaker mentioned the need to promote equal opportunities among people. Agency for Sustainable Development-Pakistan director Amaina Zaman said that one must ensure that the majority promotes the protection and preservation of the minority communities. Lawmaker Najma Afzal mentioned the suffering experienced by victims of calamities, especially those displaced by floods. He said that these people deserve "moral and economic" protection. The seminar ended with participants passing a resolution to promote peace and harmony and support the abolition of all forms of discrimination based on gender, religion, or ethnic origin. They also agreed that there is a need for decisive action by the Pakistan government to "eradicate the tendency towards violence, extremism and a wrong practice of religion."